- You can look inside the book. Counter-terrorism (also spelled counterterrorism) "is the practices, tactics, techniques, and strategies that governments, militaries, police departments and corporations adopt in response to terrorist threats and/or acts, both real and imputed." - "a unit responsible for gathering and interpreting information about an enemy." - "An intelligence agency is a governmental agency that is devoted to information gathering (known in the context as "intelligence") for purposes of national security and defense." Special Reconnaissance (SR) "is conducted by small units of highly trained military personnel, usually from Special Operations Forces (SOF) who avoid combat with, and detection by, the enemy." "is a senior unit award granted to military units which have performed an extremely meritorious or heroic act, usually in the face of an armed enemy." Unconventional warfare (abbreviated UW) "is the opposite of conventional warfare. Where conventional warfare is used to reduce an opponent's military capability, unconventional warfare is an attempt to achieve military victory through acquiescence, capitulation, or clandestine support for one side of an existing conflict. On the surface, UW contrasts with conventional warfare in that: forces or objectives are covert or not well-defined, tactics and weapons intensify environments of subversion or intimidation, and the general or long-term goals are coercive or subversive to a political body." "The United States formed the Office of Strategic Services (OSS) during WWII under the Medal of Honor recipient William J. Donovan. This organization was the predecessor of the Central Intelligence Agency (CIA) and was responsible for both intelligence and Special Forces missions. The CIA's elite Special Activities Division is the direct descendant of the OSS. In mid-1942, the United States formed the Rangers. In 1988, the Alamo Scouts were individually awarded the Special Forces Tab for their services in World War II and included in the lineage of today's U.S. Army Special Forces." "1st Special Forces Operational Detachment-Delta (1st SFOD-D) is one of the United States' secretive Tier One counter-terrorism and Special Mission Units. Commonly known as Delta, or Delta Force, it ... is officially referred to by the Department of Defense as Combat Applications Group. This unit is an elite Special Operations Force, and an Army Compartmented Element of the Joint Special Operations Command. 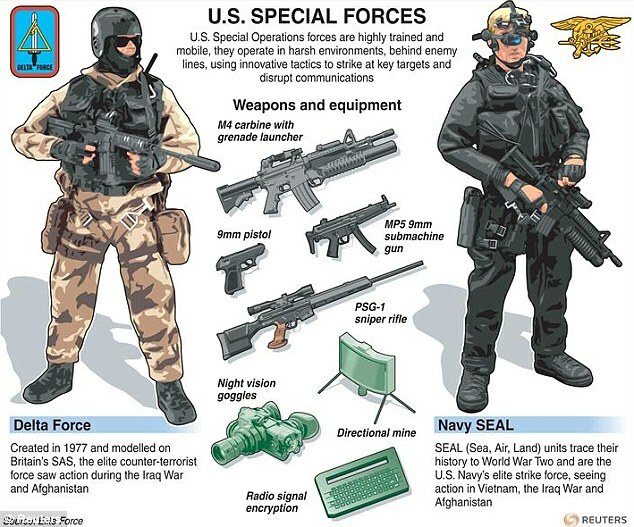 Delta Force, along with its Navy counterpart DEVGRU, are the United States' primary counter-terrorism units. Delta Force's primary tasks are counter-terrorism, direct action, and national intervention operations, although it is an extremely versatile group capable of assuming many covert missions, including, but not limited to, rescuing hostages and raids." Motto : "Surprise, Speed, Success". "Delta's main mission is counter-terrorism (CT). It is located at Pope Army Air Field and Fort Bragg in North Carolina,USA. JSOC is credited with killing Osama Bin Laden in an operation authorized by President Barack Obama on May 1, 2011 near Islamabad, Pakistan." Marine Force Recon : "United States Marine Corps Force Reconnaissance, otherwise known as Force Recon, units are a special operations force under the command of the United States Marine Corps. Many Force Recon Marines have now been integrated into MARSOC, however the Corps still retains itsown dedicated Force Recon units." The primary role of Force Recon marine is to gather intelligence in support of USMC operations. during the Drown Proofing Test at the Combat Training Tank. The trainees have their feet and hands tied and once freed they swim to safety." "The SEALs have expert snipers, able to blend in wherever they are." On May 1, 2011, a team of 20 Navy SEALs successfully completed an operation to kill Osama Bin Laden in Abbottabad, Pakistan." "For weeks, trainees endure grueling mental and physical workouts." Most military members, not just Special Forces, are eligible to receive incentive pay..."
INTERVIEW EXCLUSIVE - A quoi ressemble l'entraînement des Navy SEALS ? Réponses avec Stephen Templin, qui a survécu à la «Hell week»... - interview en français. "The first phase is most well known for "Hell Week", 132 hours of continuous physical activity..."
+ "It Pays to be a Winner"
The CIA's highly secretive Special Activities Division (SAD) and more specifically its elite Special Operations Group (SOG) recruits operators from SEAL Team Six... This cooperation still exists today and is seen in the wars in Iraq and Afghanistan." The guys that become Seals have gifted eyesight, above average intelligence, and are genetically built to withstand a lot of punishment, being pounded a lot." "The Special Activities Division (SAD) is the Central Intelligence Agency's (CIA) covert paramilitary operations unit. The Special Activities Division, sometimes referred to as the 'Special Operations Group', is made up of Paramilitary Operations Officers. CIA Paramilitaries are typically ex-military personnel and veterans of military special operations units such as the Green Berets or Marine Force Recon." The Special Activities Division (SAD) "is a division of the United States Central Intelligence Agency's (CIA) National Clandestine Service (NCS) responsible for covert and black operations as well as other "special activities" including covert political action and paramilitary special operations. Special Operations Group (SOG) is the element within SAD responsible for paramilitary operations. These operations include collection of intelligence in hostile countries and regions, and all high threat military or intelligence operations with which the U.S. government does not wish to be overtly associated. As such, members of the unit (called Paramilitary Operations Officers) normally do not carry any objects or clothing (e.g., military uniforms) that would associate them with the United States government. If they are compromised during a mission, the government of the United States may deny all knowledge." US Army Special Forces, sometimes known as 'the Green Berets', are a versatile army unit made up of 'quiet professionals'. The United States Special Operations Command (USSOCOM) is the Unified Combatant Command charged with overseeing the various Special Operations Commands (SOC or SOCOM) of theArmy, Air Force, Navy and Marine Corps of the United States Armed Forces. The command is part of the Department of Defense. USSOCOM conducts several covert and clandestine missions, such as unconventional warfare, foreign internal defense, special reconnaissance , psychological operations, Civil Affairs, direct action,counter-terrorism and War on Drugs operations." Garrison/HQ : MacDill Air Force Base located approximately 4 miles (6.4 km) south-southwest of Tampa, Florida. The job -- low pay, no holidays -- entails journeying with a partner and a dog team for 26 months and more than 5,000 miles. Injuries are virtually inevitable, as are hunger and exhaustion and frostbite..."
"The US assault on Osama Bin Laden's compound in Pakistan has been hailed as a brilliant example of its kind. By taking big risks, special forces operations can achieve goals that few would have believed possible - or they can turn into bloody disasters. Operation Jaque - Colombia, July 2008"
Osama bin Laden : Click on the pictures. Included in the CIA release are scans of Bin Laden's personal journal, videos, audio files, his correspondence, and hundreds of other documents almost exclusively in Arabic, which have been revealed an attempt to "provide material relevant to understanding the plans and workings of terrorist organizations"." "Rob O'Neill identified as the highly decorated Navy Seal who shot Al-Qaeda leader dead during 2011 secret raid in Pakistan." "A former member of the US Navy Seal team that killed Osama Bin Laden is to release a first-hand account of the May 2011 operation." + a video : "Last week, retired Navy Seals accused President Obama of leaks on the Bin Laden raid." "The book says Bin Laden was shot dead as soon as he looked out of his bedroom as Seals rushed up the stairs, AP says." "Blackhawk wreckage reveals previously unseen modifications, seemingly to reduce radar visibility and muffle noise." 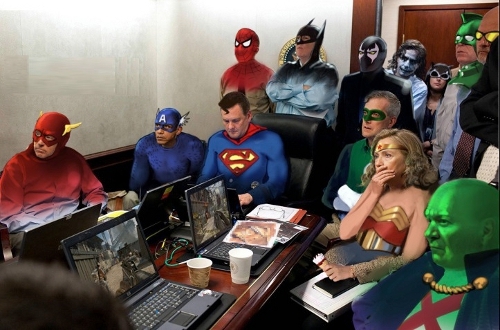 "US President Barack Obama on Friday met and decorated the "full assault force" behind the clandestine raid that killed Osama bin Laden, a White House official said." He "decorated the entire force handing out Presidential Unit Citations, the highest unit award he has the power to grant." The Presidential Unit Citation "is a senior unit award granted to military units which have performed an extremely meritorious or heroic act, usually in the face of an armed enemy." He has commanded at every level within special operations, including the leadership of a Navy Seal team..."
Read : "A career on the up"
"An Apache tribe in the US has demanded an apology from President Obama for using the name of the warrior Geronimo as the code name for Osama Bin Laden. Jeff Houser, Fort Sill Apache Tribal Chairman, said equating the legendary Apache to a mass murderer was painful and offensive to all Native Americans." According to U.S. officials a team of 20–25 US Navy SEALs under the command of the Joint Special Operations Command and working with the CIA stormed bin Laden's compound in two helicopters. Bin Laden and those with him were killed during a firefight in which U.S. forces experienced no injuries or casualties. " "dans le complexe fortifié de Ben Laden, à Abottabad, réalisé par le site du quotidien espagnol El Pais (en espagnol). Les murs d'enceinte de ce complexe étaient de trois à cinq mètres de hauteur." The fact that Bin Laden had been killed by US special forces was reported to President Barack Obama on Sunday with the words "Geronimo EKIA" - Enemy Killed In Action." These military dogs are used to find explosives, insurgents and drugs, and to help search for missing people. When their careers end after serving overseas canine veterans retire, usually at the age of 8 or 9. They can be adopted through the non-profit Military Working Dog Adoptions." "A specially trained military dog, Cairo (a Belgian Malinois) hit the ground with the Seals to help alert them to any hidden threats. He’s also the only member of the team to be identified by name." "These military dogs are highly trained, invaluable assets in the war on terror. They are capable of detecting explosives, finding enemies and chasing down anyone who tries to escape." "US embassy cables reveal elite American troops secretly embedded with Pakistan military to hunt down militants." "Led by Ambassador-at-Large Daniel Benjamin, the primary mission of the Office of the Coordinator for Counterterrorism (S/CT) is to forge partnerships with non-state actors, multilateral organizations, and foreign governments to advance the counterterrorism objectives and national security of the United States. Working with our U.S. Government counterterrorism team, S/CT takes a leading role in developing coordinated strategies to defeat terrorists abroad and in securing the cooperation of international partners." They "are relatively small, often self-sufficient combat units, consisting of highly-trained and well-equipped soldiers, that use teamwork, stealth and speed to achieve the task at hand." What Special Forces Are You? "This is for people that are undecided where they want to go. The Special Operations I have picked for this Quiz are: Air Force P.J., Navy E.O.D., Navy Seals, Army Special Forces, Army Rangers..."
"The elite units of the Airborne, Rangers and 1st Special Service Forces were used to spearhead difficult attacks and stalemates throughout the war. This quiz is a broad history and a look at some major campaigns." The Ballad Of The Green Berets "is a patriotic song in the ballad style about the Green Berets, an elite special force in the U.S. Army." The brave men of the Green Beret..."
which he has just bought for $1m. compound is visible over the roof." "The Unit" is the U.S. Army colloquial term for Delta Force." "A film dramatizing the death of Osama bin Laden is set to debut next month on the National Geographic Channel, two days before the presidential election. "Zero Dark Thirty," from director Kathryn Bigelow and screenwriter Mark Boal, who won Oscars for "The Hurt Locker,"
is scheduled to be released in theaters at the end of the year." "is a 2011 French war adventure film by Stéphane Rybojad which was shot in France, Djibouti and Tajikistan. While filming the action scenes, the actors were overseen and advised by French naval special forces according to the press folder available on the official site. Moreover one of their former chief instructors (Alain Alivon) played his own role." "An elite team of Navy SEALs embark on a covert mission to recover a kidnapped CIA agent." - American war film directed by Mike McCoy and Scott Waugh. "is a 2003 American war film, depicting a United States Navy SEAL team rescue mission amidst a civil war in the West African country of Nigeria. Lt. A.K. Waters (Bruce Willis) commands the team sent to rescue U.S. citizen Dr. Lena Fiore Kendricks (Monica Bellucci) from the civil war en route to her jungle hospital. The film was directed by Antoine Fuqua." It was produced in 1968, at the height of American involvement in the Vietnam War "
"is an action film series based on the David Morrell novel First Blood and starring Sylvester Stallone as John Rambo, a troubled Vietnam War veteran and former Green Beret who is skilled in many aspects of survival, weaponry, hand to hand combat and guerrilla warfare. The series consists of the films First Blood (1982), Rambo: First Blood Part II (1985), Rambo III (1988) and Rambo (2008)." Black Hawk Down ( = La Chute du Faucon Noir ) "is a 2001 American war film co-produced and directed by Ridley Scott and based on the book of the same name by Mark Bowden that depicts the Battle of Mogadishu, a raid integral to the United States' effort to capture Somali warlord Mohamed Farrah Aidid." "The game follows the exploits of Special Forces troops battling insurgents in Afghanistan in 2002. In August, Defence Secretary Dr Liam Fox called for the game to be banned after it emerged that users could fight as The Taliban."